Essay on the principles of translation. by Woodhouselee, Alexander Fraser Tytler, Lord, 1747-1813. Publication date . Topics Translating and interpreting. Publisher London : J. M. Dent & co.; New York, E. P. Dutton & co. Collection cdl; americana. Digitizing sponsor MSN. Contributor University of California Libraries. 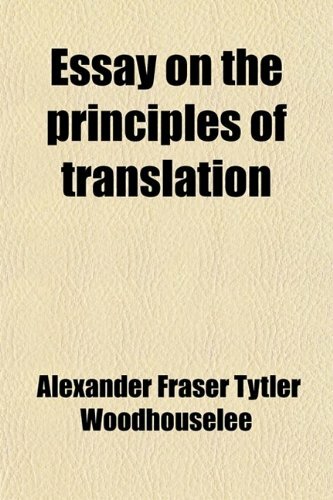 Essay On The Principles Of Translation [Lord Alexander Fraser Tytler Woodhousele] on Amazon.com. *FREE* shipping on qualifying offers. This is a reproduction of a book published before 1923. This book may have occasional imperfections such as missing or blurred pages.